3/Thirds created a multi-faceted campaign to create awareness for Pacific Power’s Smart Meter installation program. A strategic messaging framework was established to align their identified target audiences (both B2B and B2C) with key campaign-specific content and visuals under their newly defined umbrella brand identity. An array of online and offline assets—including a postcard, infographic, bilingual customer letter, door hangers and more—were created to ensure the large, varied, multi-lingual audience was reached across multiple touch points. 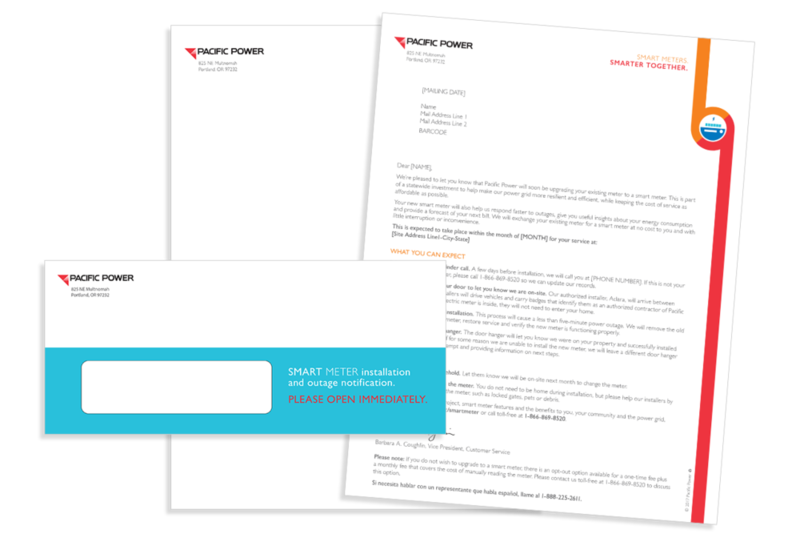 Assets ultimately drove to a refreshed Smart Meter microsite hosted on PacificPower.net that was updated to improve the customer experience and reflect the newly updated campaign aesthetic and messaging. A series of three videos were created to tell the full Smart Meter story, from positioning their role in a clean energy future to showcasing their benefits and how they empower customers to make smart energy decisions. These videos were integrated into the Smart Meter microsite and leveraged for social channels.